In Fallout 4, you will find a corresponding armor for most situations. So that you will not suffer falling damage when falling from great heights, you can use power armor or even the freefall armor. Also for underwater search you can make or buy corresponding radiation protection armor from the Diamond City market. This will cost you 200-300 Capsules depending on action skill and the armor will greatly facilitate you to find the underwater secrets. 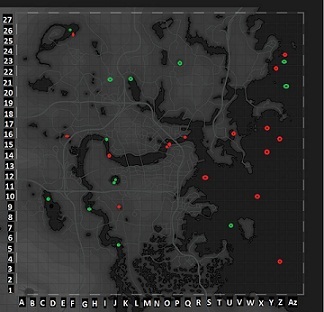 The map that you see below was created by passionate Fallout 4 player Lavon "Lavonicus" Smith, who spent 30 hours in the underwater world to examine every square meter of the sea and recorded interesting places on a specially prepared map with which you can explore under the sea and all of its Secrets. - Green: Here you will find treasures, safe locations and articles for looting. - Red: At these places you will find things like sunken ships or even crashed aircraft. Of course we do not want to spoil you with the items you will find underwater, so you can use the map with the coordinates to visit the locations and let yourself be surprised. - Arm yourself with a lot of RadAways and Rad-X. The first cures partly suffered radiation damage, the second reduces this. - The perk "Aquaboy" - This can be found in the endurance-talent tree your special attributes. With 5 points invested in endurance, it protects you against radiation damage while swimming and you can also stay underwater longer period without taking a breath. - A Power Armor also protects you with radiation damage, but you can not swim in the water with it. - Radiation protection suit is much better than the power armor. This you can buy from Becky in Diamond City market.